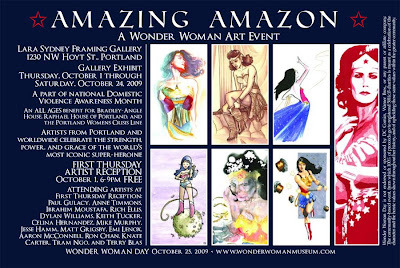 Wonder Woman Day is coming up, and the Lara Sydney Gallery in Portland is hosting a show with several of the donated pieces from the WWD charity auction. 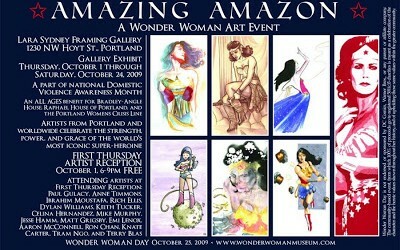 Mine has been chosen as one (bottom left of the promo card! ), and I just thought I’d let y’all know in case you happen to live in Portland or will be there over the month of October. Also, if you are interested in buying any of the donated pieces, I’m told that the ones at the gallery will have a “buy now” price, so they might not make it to the silent auction, let alone the online auction. If you have your heart set on one, make sure to go to the show opening on October 1st!